Matte surfaces, that is, those that are dull or lusterless not glossy and shiny, are a current trend in packaging. But does packaging surface affect what consumers think about the product inside it? We focus on consumers’ perception of packaged food products at the point of sale. Using three experiments, we show that food in matte packaging can be perceived as more natural. Notably, the effect of matte packaging only holds for rather artificial products. When matte packaging increases perceptions of product naturalness, consumers also expect the product to be tastier and are more likely to buy it. Most food comes packaged. This packaging has a surface, and this surface can be either matte, that is, dull or lusterless, or glossy and shiny. All things being equal, does it matter whether food is offered in matte or glossy packaging? In this paper, we suggest and find that it does—at least for certain products. Although the surface of the packaging bears no relation to the actual product, we find that it can affect a food’s perceived naturalness, which is something that today’s consumers care about (Bezawada and Pauwels 2013). In three experiments, we show that matte, as opposed to glossy, packaging surfaces can induce perceptions of naturalness at the point of sale. We find this across diverse product presentation settings (multiproduct lab and single product online presentation), products (ketchup, soda, and protein bars), and different types of product inspection (visual and haptic). Notably, we also find that the surface only successfully signals naturalness for food that is not perceived as natural to begin with. Finally, we find that the perception of a product as natural, in turn, improves taste expectations and purchase intentions. Results imply that marketers can use matte packaging to subtly increase perceived naturalness of food that consumers expect to be rather artificial. Packaging is a “key marketing tool” (Krishna et al. 2017, p. 43) that allows companies to get in contact with virtually all (potential) customers directly at the point of sale (Ampuero and Vila 2006). It is an attribute that is “not part of the physical product” and serves as an extrinsic cue about the product it contains (Richardson et al. 1994, p. 29). Packaging has many dimensions that can influence the perception of its content. For instance, packaging shape has been shown to influence perceived product quantity (Folkes and Matta 2004) and calorie content (Koo and Suk 2016), and packaging size has been shown to serve as a quality cue (Yan et al. 2014). To date, the academic literature has focused mostly on visual elements such as pictures and colors. For example, visuals have been shown to affect perceptions of quantity (Madzharov and Block 2010), heaviness (Deng and Kahn 2009), environmental impact (Seo and Scammon 2017), tastiness (Mai et al. 2016), and perceived smell (van Rompay et al. 2014). Packaging surface, in contrast, has received comparably scant attention in the packaging literature. Yet, like other packaging elements, packaging surface could also signal something about the content, but we still know little about what signals the surface may send. We draw on research outside the field of packaging and suggest that packaging surface may influence perceptions of product naturalness. However, based on earlier research, the direction of this influence is unclear. On the one hand, Meert et al. (2014) draw on evolutionary psychology to suggest that glossy surfaces are associated with wetness (Coss 1990) and thus link glossiness with the biological need for fresh water. Given that water is a natural resource, it is possible that glossy surfaces elicit thoughts about nature, which then spill over to whatever hides beneath that surface. On the other hand, insights from physics suggest that matte surfaces might align with naturalness because they are typical for organic materials (Nayar and Oren 1995). Whether or not a surface is perceived as natural depends on how it reflects light. Natural scientists distinguish between so-called specular reflections, where an incident ray is reflected at just one angle, and diffuse reflections, where an incident ray is reflected at many angles (Motoyoshi et al. 2007; Nayar and Oren 1995). If a surface is very smooth, specular reflections dominate and result in a glossy or even mirror-like appearance. If a surface is rough, reflections are more diffuse and “distributed in a wide range of directions, giving the surface a matte appearance” (Nayar and Oren 1995, p. 1153). While specular reflections and glossy surfaces are typical for metals, many organic materials, such as earth or clay, produce diffuse reflections and are hence perceived as matte (Nayar and Oren 1995). Industrial designers have likewise found that mattedness and roughness are indices of natural materials (Karana 2012). While these different streams suggest that both glossiness and mattedness may signal naturalness, the former does so via the extra step of associations with water, whereas the latter does so via a direct reference to the packaging material. We thus assume that the more direct effect prevails and that mattedness leads to perceptions of naturalness. Compared to many other signals of naturalness, such as a food’s inherent naturalness or claims of naturalness, packaging surface is a subtle signal. Whether or not stronger signals of naturalness are present is likely to matter. Again, the effect could go both ways. On the one hand, packaging surface signals may have little additional effect when a product is already perceived as natural (c.f. Feldman and Lynch 1988). Packaging surface could thus affect product naturalness only when no other naturalness cues are available. On the other hand, although subtle, signals sent by the packaging surface could still reinforce other signals of naturalness (c.f. Kamins and Gupta 1994). It is an open question as to whether any effect of packaging surface generalizes across products or is contingent on the absence or presence of other cues of naturalness. To summarize, the current literature implies that the surface of a packaging might send signals about the naturalness of the food it contains. It also suggests that the degree to which this happens depends on the presence of stronger signals of naturalness. However, the literature holds no clear prediction about the direction of both the main effect of surface and the likely moderation through direct signals of naturalness. To establish the effect of surface on perceived food naturalness, we conducted three studies. In study 1, we tested for the main effect of packaging surface in the context of ketchup, a product low in perceived naturalness. In the subsequent studies, we tested for moderation and manipulated the presence of other signals of naturalness. In study 2a, we manipulated the naturalness of the product category, soda versus tea. In study 2b, we manipulated whether or not the product claim positioned a protein bar as natural. Across studies, we used different modes of product presentation. Studies 1 and 2a were conducted in a laboratory setting and resembled point of sale situations, where glossy and matte packages are displayed side by side (Silayoi and Speece 2004) and subtle cues can become more salient (c.f. Sevdalis and Harvey 2006). In contrast, study 2b mirrored common online shopping situations where consumers can zoom in on products one at a time. Across all studies, we explored potential downstream consequences in the form of expected product tastiness (studies 1, 2a, and 2b) and purchase intention (studies 2a and 2b). In study 1, participants had to either compare a matte-packaged ketchup to its glossy equivalent or vice versa (c.f. Meyvis and van Osselaer 2017). In the store, consumers can both look at and touch products. To ensure that our results generalize to different modes of product inspection, we also varied the way in which consumers inspected the products. In-store observations showed that ketchup is commonly available in both matte and glossy packaging and consumers would thus be acquainted with both surfaces. An additional pretest (n = 34) indicated that ketchup is perceived as rather artificial (M = 2.97, SD = 1.70; 1 = artificial, 7 = natural). In study 1, 136 students (female = 49%, Mage = 21.8) participated in a laboratory experiment featuring a 2 (packaging surface: matte vs. glossy) × 2 (type of inspection: touch vs. visual) between-subjects design. The participants were seated separately at individual desks. The experimenter put two unbranded ketchup bottles (see Appendix) in front of each participant. One bottle was coated with glossy and one with matte varnish. Participants were assigned to evaluate either the matte packaged ketchup compared to the glossy one or vice versa. To manipulate the type of inspection, respondents were explicitly asked either to touch and handle the packaging or to inspect it merely visually. After the participants inspected the packaging, we measured perceived naturalness of the ketchup contained in the focal packaging (1 = more artificial, 7 = more natural than the other product) and expected tastiness of the product (1 = less tasty, 7 = tastier) as a downstream consequence. To avoid a relevant potential confound, we also assessed perceived quality of the product (1 = lower quality, 7 = higher quality). Finally, we ascertained that our surface manipulation was visible by including a manipulation check item (1 = more glossy, 7 = less glossy) before thanking and financially compensating participants. As intended, the matte packaging was perceived as significantly less glossy than the glossy packaging (Mmatte = 6.83, SD = 0.60 vs. Mglossy = 1.24, SD = 0.60; t(134) = − 54.42, p < .001, d = − 9.40). A 2 × 2 ANOVA yielded a main effect of packaging surface on perceived naturalness of the product (Fsurface(1132) = 26.71, p < .001, η2 = .17). The product in the matte packaging was perceived to be more natural (Mmatte = 4.52, SD = 1.27 vs. Mglossy = 3.43, SD = 1.16) (see Table 1 for all means). There was neither a significant effect of type of inspection (Finspection(1,132) = 0.04, p = .851) nor an interaction effect (Finteraction(1,132) = 0.94, p = .334). The main effect of packaging surface remained highly significant (F(1,132) = 35.32, p < .001, η2 = .21) when we controlled for quality perception as a covariate (p < .001). Next, we tested for tastiness as a potential downstream consequence of the effect of surface on perceived naturalness. We conducted mediation analysis with bootstrapping using PROCESS Model 4 (Hayes 2013). Perceived product naturalness mediated the effect of packaging surface on expected tastiness (indirect effect: CI95 [0.36, 0.98]). There was no additional direct effect of surface on tastiness (CI95 [− 0.59, 0.12]). These results suggest that matte packaging acts as a naturalness cue. 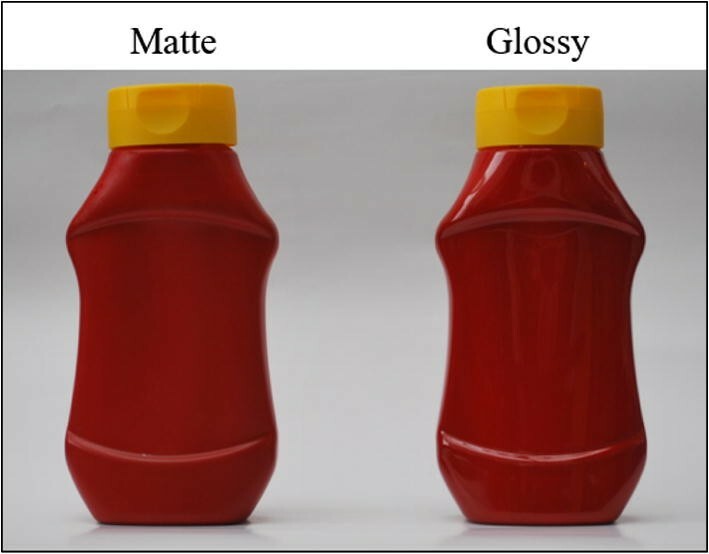 The ketchup in matte packaging was perceived as more natural when compared to the same product in glossy packaging. This effect arose independent of haptic product inspection and of differences in perceived product quality. Moreover, the increase in perceived product naturalness resulted in an increase in expected tastiness. Notably, we found this in the context of a rather artificial category of food. Our main aim in study 2a was to investigate whether the effect of matte packaging on perceived food naturalness extends to food that is not perceived as artificial. Consequently, we varied packaging surface and the naturalness of the product category. To generalize the results of study 1, we extended the investigation to a new product category (bottled drinks) and to another relevant product inspection context. Both glossy and matte packages were visible but participants only focused on one of them. Study 2a used drinks that differ in terms of perceived inherent product naturalness but are otherwise similar. Raspberry soda and raspberry iced tea fulfilled these criteria. A pretest (n = 11) confirmed that raspberry soda (M = 2.18, SD = 0.98; 1 = artificial, 7 = natural) but not raspberry iced tea was perceived as inherently artificial (M = 5.36, SD = 1.36; t(10) = 4.94, p < .001, d = 3.12). Both drinks were equally liked (t(10) = − 0.68, p = .510). 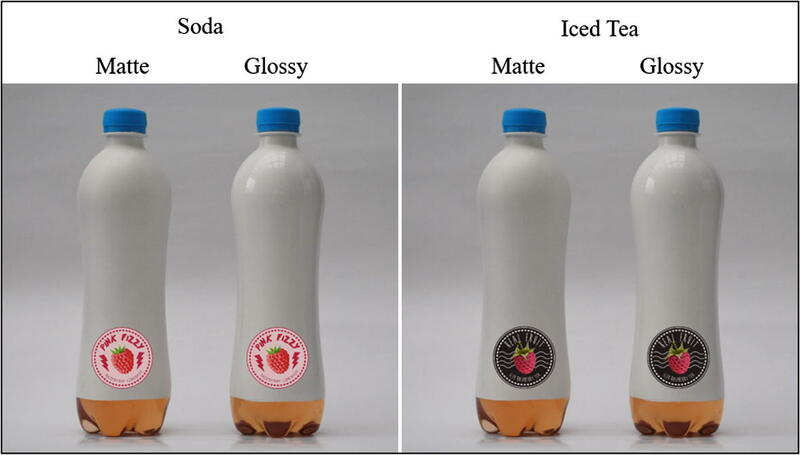 Another pretest (n = 34) confirmed that the professionally designed logo of “Real Fruit Iced Raspberry Tea” was perceived to indicate a more natural content (M = 4.56, SD = 1.21) than the “Pink Fizzy Raspberry Lemonade”1 logo (M = 2.56, SD = 1.48; t(33) = 6.45, p < .001, d = 2.25) (see Appendix). To manipulate packaging surface, we coated bottles featuring the logos with white matte and glossy varnish. This yielded a 2 (packaging surface: matte vs. glossy) × 2 (category naturalness: artificial soda vs. natural iced tea) between-subjects design. In return for partial course credits, 240 students (female = 65%, Mage = 23.1) were randomly assigned to one of the four conditions and seated at separate desks. We placed one matte and one glossy bottle of the same type of drink in front of them. Depending on the randomly assigned condition, participants were instructed to evaluate either the matte or the glossy bottle. The items we assessed mirrored those used in study 1 but answers pertained to the focal product only. In addition, we assessed purchase likelihood (1 = very unlikely, 7 = very likely) as another relevant downstream consequence. As intended, the matte packaging was perceived as significantly more matte than the glossy packaging (Mmatte = 6.18, SD = 1.31 vs. Mglossy = 3.51, SD = 2.21; t(193.30) = 11.39, p < .001, d = 1.64). A 2 × 2 ANOVA on perceived product naturalness yielded a main effect of category on naturalness (Fcategory(1,236) = 17.28, p < .001, η2 = .07). The iced tea was perceived to be more natural than the soda (Mtea = 3.34, SD = 1.45 vs. Msoda = 2.59, SD = 1.33). Importantly, this main effect was qualified by an interaction with packaging surface (Finteraction(1,236) = 4.11, p = .044, η2 = .02). There was no main effect of surface (Fsurface(1,236) = 0.59, p = .444). The artificial soda was perceived as more natural in the matte than the glossy packaging (Mmatte = 2.84 vs. Mglossy = 2.34; t(114) = 2.06, p = .042, d = 0.39). In contrast, packaging surface made no difference to the perception of naturalness for tea (t(122) = − 0.86, p = .389). When we added perceived product quality as a covariate (p < .001), the earlier-observed interaction between packaging surface and category naturalness remained significant (F(1,236) = 4.60, p = .033, η2 = .02), although the main effect of product category became insignificant (F(1,236) = 1.90, p = .170). Next, we tested for potential downstream consequences of this moderated effect of surface on perceived naturalness. We conducted a moderated mediation analysis (PROCESS Model 7, Hayes 2013) with packaging surface as the independent variable, perceived product naturalness as the mediator, and expected product tastiness as the outcome. As in the prior analyses, product category naturalness was added as a moderator to the effect of surface on the mediator perceived naturalness. The results (moderated mediation coefficient b = 0.24; CI95 [0.01, 0.51]) suggest that for the artificial soda (CI95 [− 0.35, − 0.01]) but not for the natural tea (CI95 [− 0.09, 0.26]), perceived product naturalness mediates the effect of packaging surface on tastiness. There was no additional direct effect of surface on expected product tastiness (CI95 [− 0.55, 0.18]). We found a similar moderated mediation for purchase likelihood as dependent variable (moderated mediation coefficient b = 0.34; CI95 [0.02, 0.69]). There was an indirect effect of surface via naturalness on purchase intention for the artificial soda (CI95 [− 0.47, − 0.01]) but not for the natural tea (CI95 [− 0.15, 0.35]). There was no additional direct effect (CI95 [− 0.58, 0.20]). Study 2a replicates the findings from study 1 in another product category (soda). Matte packaging enhanced perceptions of naturalness and, in turn, affected expected tastiness and purchase intentions. Importantly, matte packaging only increased perceived product naturalness when the product was not perceived as natural already. We did not observe an effect of packaging surface for a product that is already deemed to be somewhat natural (iced tea). Rather than reinforcing existing cues for naturalness, matte packaging surfaces appeared to compensate for the lack of such cues. Notably, we manipulated these cues via product category. We cannot entirely preclude that the moderating effect was driven by category differences that had nothing to do with the inherent product naturalness. Study 2b aimed to provide a conceptual replication of the moderating effect of strong naturalness cues. We kept the product constant and varied the claim on the product. To generalize results, we chose a product category that can benefit from both increased naturalness (healthier nutrition) and increased artificiality (more effective energy provision): protein bars. In addition, we extended the inquiry to another product inspection context. Mirroring the situation of online shopping where consumers can zoom in on one product at a time, participants either saw a picture of the matte or glossy product on a screen. Finally, we assessed claim believability as another potential mechanism. Study 2b featured a 2 (packaging surface: matte vs. glossy) × 2 (naturalness claim: present vs. control) between-subjects design. Overall, 231 US mTurkers (female = 42%, Mage = 34.1), who indicated that they consume protein bars at least several times per year, were selected for the study. Depending on the condition to which they were randomly assigned, participants evaluated one of four pack shots of a protein bar not available in the US (see Appendix). The pack shots only differed with regard to their surface. The glossy pack shot was visibly glossy and held reflections. To achieve a matte look, we edited this shot and removed all reflections in the matte condition (see Appendix). Because still images do not depict lighting (and therefore mattedness and glossiness) as accurately as actual objects (Artusi et al. 2011), a description of the wrapper (“The protein bar is packed in a matte/glossy wrapper”) reinforced this manipulation. Participants in the control condition saw the visual slogan “All Power.” Participants in the natural claim condition saw the slogan “All Natural. All Power.” To generalize results to another measure of perceived food naturalness, we asked respondents to estimate the percentage of natural ingredients in the protein bar. Expected tastiness, purchase intention, and the manipulation check were assessed with the same items as in study 2a. To address whether packaging surface also affects the believability of the naturalness claim by subtly reinforcing it (c.f. Mazis and Raymond 1997),2 we also assessed claim believability with the item “This protein bar delivers what it promises.” We also included an instructional manipulation check (c.f. Oppenheimer et al. 2009) and assessed personality differences in claim skepticism via the skepticism scale developed by Mohr et al. (1998) but found that it did not affect any of our results and thus do not report it. Twelve inattentive respondents who failed the instructional manipulation check were removed from further analyses. As intended, the matte packaging was perceived as significantly more matte than the glossy one (Mmatte = 5.86, SD = 1.39 vs. Mglossy = 2.36, SD = 1.76; t(190.31) = − 15.97, p < .001, d = − 2.32). A 2 × 2 ANOVA on perceived product naturalness yielded main effects of the naturalness claim and packaging surface qualified by a significant interaction term (Fclaim(1,207) = 33.87, p < .001, η2 = .14; Fsurface(1,207) = 4.02, p = .046, η2 = .02; Finteraction(1,207) = 4.79, p = .030, η2 = .02). Reconfirming the claim manipulation, the protein bar featuring the naturalness claim was perceived to contain more natural ingredients (Mnatural = 71.05, SD = 23.74 vs. Mcontrol = 53.14, SD = 22.40) (see also Table 1). Moreover, the protein bar in the matte packaging was perceived to be more natural (Mmatte = 65.18, SD = 22.58 vs. Mglossy = 59.17, SD = 26.62). Notably, this effect of packaging surface only emerged in the control group. In the absence of a naturalness claim, the matte packaging surface boosted the perceived extent of natural ingredients to above 50% (Mglossy = 46.24, SD = 22.17 vs. Mmatte = 59.39, SD = 20.89; t(101) = − 3.10, p = .003, d = − 0.62). In contrast, when a naturalness claim was present, surface had no effect on perceived naturalness (t(106) = 0.13, p = .900). To test for a potential role of claim believability, we ran a 2 × 2 ANOVA on claim believability and found a marginally significant effect of surface only (Fsurface(1207) = 2.95, p = .087, η2 = .01; Fclaim(1,207) = 0.08, p = .774; Finteraction(1,207) = 2.04, p = .155). The matte package was perceived to deliver somewhat more believable claims than the glossy package (Mmatte = 4.86, SD = 1.10 vs. Mglossy = 4.60, SD = 1.05). When we controlled for believability as a covariate (p < .001), the main effect of surface on naturalness was attenuated (F(1,207) = 2.10, p = .149), but the interaction effect of packaging surface and claim remained highly significant (F(1,207) = 8.59, p = .004, η2 = .04). In addition, we tested for potential downstream consequences of this moderated effect of surface on perceived naturalness. We replicated an indirect effect of surface on expected tastiness in a moderated mediation analysis (moderated mediation coefficient b = − 0.33; CI95 [− 0.64, − 0.03]). In the control condition, we observed an indirect effect of surface on expected tastiness via perceived naturalness (CI95 [0.11, 0.44]). We observed no such effect when the claim “All Natural.” was added (CI95 [− 0.23, 0.22]). There was no additional direct effect of surface on expected product tastiness (CI95 [− 0.37, 0.37]). Adding believability as a parallel mediator, we found that claim believability also predicts expected tastiness (p < .001) but neither mediates the effect of surface (moderated mediation coefficient b = 0.13, CI95 [− 0.04, 0.39]) nor alters the effect via perceived naturalness (moderated mediation coefficient b = − 0.27, CI95 [− 0.54, − 0.03]). We found a similar moderated mediation for purchase likelihood as dependent variable (moderated mediation coefficient b = − 0.29, CI95 [− 0.60, − 0.03]). In the control condition, we observed an indirect effect of packaging surface on purchase likelihood via perceived naturalness (CI95 [0.09, 0.51]). Once a naturalness claim was added, surface had no indirect effect on purchase intention (CI95 [− 0.21, 0.19]). There was no additional direct effect of surface (CI95 [− 0.43, 0.43]). 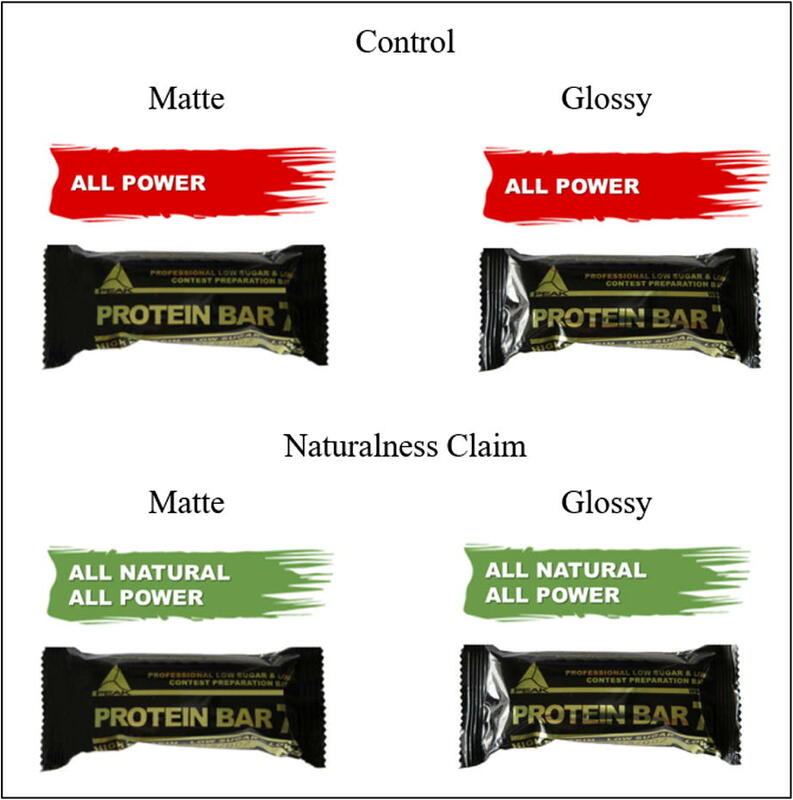 Similar to the physically present ketchup and soda, we found that matte packaging can enhance perceptions of naturalness for a protein bar depicted online. In the absence of a naturalness claim, the matte packaged bar was believed to contain more natural ingredients than the glossy packaged bar, which translated into better expected taste and higher intentions to purchase. However, once we added a naturalness claim, these effects disappeared and packaging surface made no difference to consumer perceptions. Study 2b thus confirms that stronger signals of product naturalness serve as a relevant boundary condition. In addition, we found that claims on matte packages were considered to be more believable. This, however, did not drive the effect on perceived naturalness. All food packaging has a surface that can easily be altered without changing anything else about the product. We simply coated packages with glossy and matte varnishes. This coating sufficed to affect perceived naturalness of certain food products such that food in matte packaging was expected to be more natural than in glossy packaging. These results are in line with insights from the natural sciences that suggest that matte surfaces are characteristic of organic and thus natural substances (Nayar and Oren 1995). A prior observed effect of glossiness on appeal does not appear to generalize to perceptions of naturalness (c.f. Meert et al. 2014). Importantly, consumers only appear to infer food naturalness from packaging surface when no stronger cues of naturalness are present. Products that are relatively natural (study 2a) or claim to be natural (study 2b) do not appear to benefit from matte packaging. In addition, the inference of naturalness does not depend on claim believability (study 2b). The surface appears to send its subtle signals of naturalness implicitly and without the need for congruence with other product information. This implies that matte packaging could mislead customers into believing that a product is somewhat less artificial than it actually is. Consistent with earlier research (Klatzky et al. 1993), this effect of matte packaging emerged regardless of whether customers merely visually examined or actually touched the package (study 1). This means that our results can generalize to the relevant and growing field of online grocery shopping as approximated in study 2b. Speaking of the relevance of this finding, we also show that packaging-induced perceived naturalness improves the expected tastiness of the product and increases purchase likelihood. This fits with prior research that finds that organic food is perceived to taste better than “regular” food (Lee et al. 2013) but is inconsistent with findings on product healthiness, which tends to be associated with reduced taste expectations (Mai et al. 2016; Raghunathan et al. 2006). In addition, we find no consistent direct effects of surface on expected tastiness. Future research on the relationship between perceived naturalness and taste expectations may help to align these conflicting insights and to identify potential other processes at play. In our research, we focused on food products. We assume that the effect would generalize to other fast moving consumer goods that are perceived as rather artificial, such as many personal-care products. The jury, however, is still out; this is also the case for other potential boundary conditions such as prior experience and packaging material. We used unbranded products (study 1) or unknown brands (studies 2a and 2b) and looked at products packaged in hard plastic and plastic foil. Future research is needed to ensure that our insights on the main effect of surface and the moderating effects of naturalness cues generalize to other packaged goods. Note that in the country of the study, lemonade is a synonym for soda. We thank an anonymous reviewer for this suggestion. Open access funding provided by Vienna University of Economics and Business (WU). Meyvis, T., & van Osselaer, S. M. J. (2017). Increasing the power of your study by increasing the effect size. 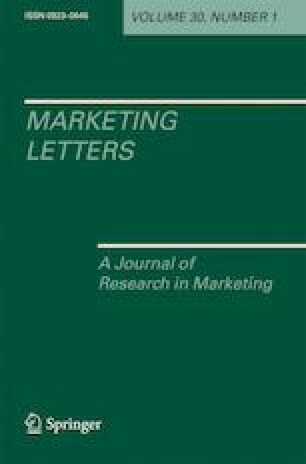 Journal of Consumer Research, ucx110–ucx110. https://doi.org/10.1093/jcr/ucx110.